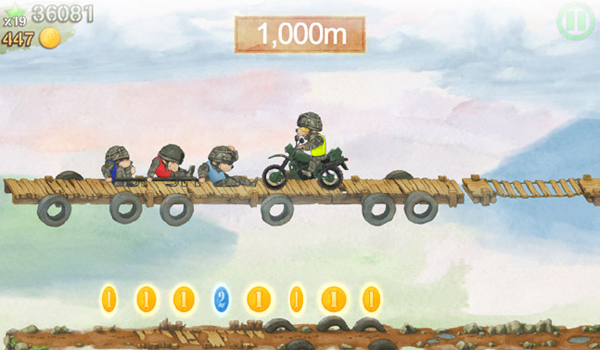 HELP for Heroes has launched a brand new fundraising game app. So stand by your mobile (or tablet) and answer the call of the Hero Bear’s Army! How far can you help the Hero Bears run with their wounded brother? Hero Bear has been in training for months to prepare for his moment of fame – jumping over chasms, boulders and dodging danger. In the new fundraising mobile game, you have to run as far as you can, ducking and jumping to avoid dangerous obstacles. Carrying a bear on a stretcher, the aim is to collect as many coins as possible to gain a high score. Along your way you’ll either be berated by celebrities including Jeremy Clarkson, or encouraged by Lorraine Kelly! More than ever Help for Heroes needs to raise money in every way possible to support our wounded and their families. And what better way than by having fun at the same time? By downloading the app you’ll be doing your bit, as £1 from every game sold goes to the charity. The app has been created for free by Supersonic Software and is brought to you by AppyNation. Your mission is to download it via the iTunes App Store, Google Play or Kindle Fire, and share it with everyone you know!